It is an elegant work of art. Its also a fine instrument that follows you wherever you go. The black and white keys are supported by a cool silver colour aluminium panel arching down at the front and a holder hidden at the rear bottom. These silky smooth keys intertwine with the aluminium grille. It presents the appearance of keys floating evenly at the edge of a waterfall. 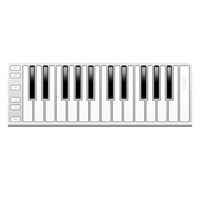 The CME Xkey 37-Key USB Keyboard is a simple to use but powerful MIDI controller. Slim stylish lightweight and durable the Xkey-37 is 20 percent lighter than a MacBook Air making it the perfect travelling companion. 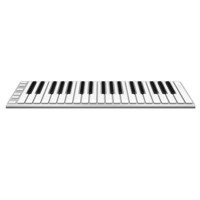 37 full size keys give you three octaves of playability and creativity and with octave + and – buttons you have a full range keyboard at your hands. The new XCable enables you to get the proper keyboard performance you have been looking for by offering MIDI out Sustain and expression pedal inputs.